The U.S. Army has placed a $39 million order for tiny reconnaissance drones, small enough to fit in a soldier’s pocket or palm. The idea behind the drones, which are made by FLIR Systems and look like tiny menacing helicopters, is that soldiers will be able to send them into the sky of the battlefield in order to get a “lethal edge” during combat, according to Business Insider. 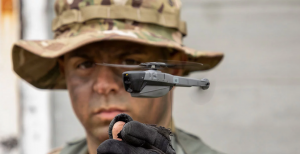 FLIR Systems is currently delivering its “nano-unmanned aerial vehicles,” which it calls Black Hornet Personal Reconnaissance Systems, according to a press release that says the Army is starting an “initial integration” of the drones. “This contract represents a significant milestone with the operational large-scale deployment of nano-UAVs into the world’s most powerful Army,” said Jim Cannon, the CEO of FLIR Systems, in the press release.